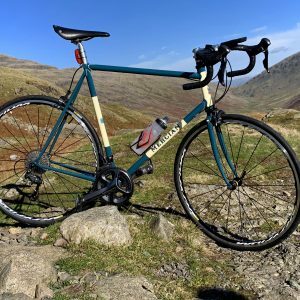 This fantastic bike got me up Hardknott pass at the weekend – as well as Wrynose, Whinlatter, Kirkstone, Newlands and, only just, Honister. There was rain and a howling headwind by the time we got to Honister but the bike is a total joy and every inch was a pleasure (sort of), come rain or shine. I am a lucky dog to be in possession of such a very special machine and I wanted to thank everyone involved in its creation.